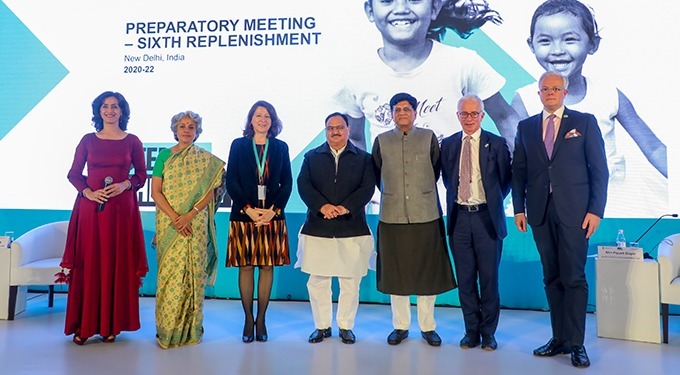 “India has set an example globally by increasing its domestic financial allocations for health, said JP Nadda, Union Minister of Health and Family Welfare during his address at the Preparatory Meeting of the Sixth Global Fund Replenishment which is being held in New Delhi. The Global Fund is seeking to raise at least $14 billion for the next three years to help save 16 million lives, cut the mortality rate from HIV, TB and malaria in half, and build stronger health systems by 2023. Piyush Goyal, Union Minister of Finance, Corporate Affairs, Railways and Coal; Agnès Buzyn, Minister of Health and Solidarity, Government of France; Ambassador Jean Claude Kugener, Permanent Representative of Luxembourg to India; Dr Soumya Swaminathan, Deputy Director General of Programmes, WHO; and Peter Sands, Executive Director, The Global Fund, and delegations and representatives from several countries were also present. Nadda stated that India has been consistently exhibiting successes in the arena of health as an outcome of focussed policies, strategies and programmes. “We are now in a position, where we are talking of elimination of these diseases. In fact, our Prime Minister Narendra Modi has fixed a target for us to end TB by 2025, five years ahead of the Sustainable Development Goals of 2030,” Nadda elaborated. The Union Health Minister also said that the Global Fund has helped in scaling up ART treatment for people living with HIV (PLHIV), transition to viral load testing to monitor treatment outcomes, expand counselling and testing services, especially for the marginalised and key populations as well as move towards elimination of parent to child transmission of HIV. He also appreciated the support of Global Fund in providing Long Lasting Insecticidal Nets (LLIN) to the endemic areas and implement other elimination strategies. “The impact of these interventions has been well demonstrated in the World Malaria Report 2018, where India has been the only high-burden country to show a significant 24 per cent decline in incidence,” Nadda added. He said that the investments will come, provided the high-burden countries also take ownership and accountability, also adding that the Government of India has significantly increased the budgetary allocations for health. “India has demonstrated that, if there is a will and political commitment, we can do it. I urge all my fellow countries to also lead by example,” he mentioned. Piyush Goyal, Union Minister of Finance, Corporate Affairs, Railways and Coal, stressed that India is committed to increasing its domestic financial resources against the three diseases of malaria, TB and HIV/AIDS. “India is committed to improving the health of its people. We are stepping up our national domestic spending to end TB and other infectious diseases,” Goyal said. “By building affordable, accessible and quality health services for all our people, we are not only making a case for better health, but also making an argument for faster and more inclusive growth,” he added. Agnès Buzyn, Minister of Health and Solidarity, Government of France, stated that it is time to step up the fight to end the three epidemics by 2030. She urged all stakeholders to make this conference a success. “More than ever, we all need to come together for global health. France will carry this powerful message throughout 2019, notably through our presidency of the G7 and at the Ministerial Health Meeting which I will host on May 16-17 in Paris,” she added. Peter Sands, Executive Director of the Global Fund, commended the Prime Minister Narendra Modi’s leadership in global health and said commitment and resources from national government is essential to meeting the Sustainable Development Goals. “Reaching the Sustainable Development Goals requires the kind of global solidarity we have seen in New Delhi,” Sands said. “With India’s leadership, we can take a massive step towards ridding the world from these epidemics,” he mentioned.